Finally the fruit purée ic has time to get to work. It’s steamed apple purée! Think – the yummy steaming apple in apple crumble! Naturally sweet and smooth. Cut the apples into pieces and steam them for 15 minutes. Blend them. Simple riiiggghhhttt? And so, 小小宝贝 had a whale of a time eating his apple purée. He downed 6 teaspoons of it. I didn’t get back in time to snap his photo. 🙁 I could only rely on the testimonial given by the proud daddy. 宝贝 got to eat apple yoghurt today. She hadn’t had it for the longest time ever. She even licked her bowl clean. =.=” yup it was THAT yummy. 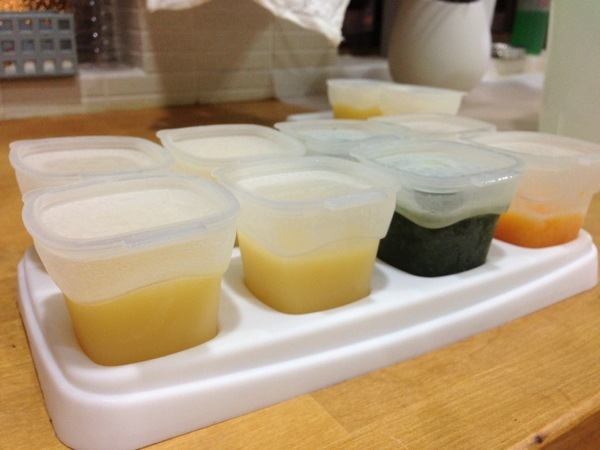 *Rows of purée. Apple, spinach then pumpkin. Soon he will get to eat a wider variety of purée. A great start to an exciting adventure!